The World War One German invasion of Belgium… What happened next? General Gerard Leman., the Belgian in charge of the defense of Liege. General Leman set up his headquarters in Liege on July 31, 1914. On August 3, he ordered the destruction of the bridges, tunnels, and railways connected to Liege as the German forces began to flood across the small Belgian border. The next day the German Army of the Meuse arrayed for battle outside the ring of forts. An ultimatum was sent out to allow the Germans to enter Liege. Leman boldly refused the demand to surrender. The Third Division occupying the trenches between the easternmost forts was attacked by the units of the Army of the Meuse. The German officers arrogantly launched their assault shoulder to shoulder as if organized on a parade ground against the sheltered Belgian defenders. The German assault was cut to pieces with the help of Belgian machine guns placed in the adjacent forts. At Fort Barchon, the Belgians mounted a counter strike and threw the wavering Germans back with their bayonets. The German attackers withdrew bloodied and completely stunned by the dogged Belgian resistance. The Germans mounted a daring attempt to capture or assassinate Leman on August 6. A detachment of thirty German soldiers and nine officers dressed as British soldiers drove up to Leman’s headquarters. 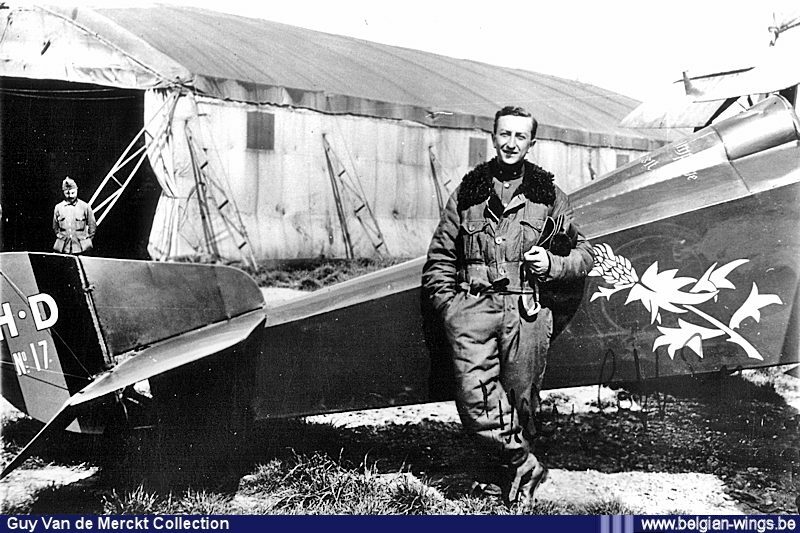 One of Leman’s aides, Major Marchand, soon caught on to the trap and alerted the headquarters, but was subsequently shot down. The surprise German attack carried Leman’s headquarters, but in the confusion Leman escaped to Fort Loncin, west of the city. The German high command decided on the realignment of their strategy by focusing on capturing the city of Liege itself. Thousands of German reinforcements were soon flooding to the outskirts in an attempt to make a concentrated breakthrough past the forts into the city. After refusing to surrender once again, Liege was shelled on August 6 by a Zeppelin LZ-1, killing nine civilians. The Germans would become vilified for the atrocities committed against the Belgian population. With enough pressure, there was a breakthrough between Fort Fleron and Fort Evegnee on August 10, putting the Germans in range of Liege itself. The Third Division was controversially sent to join the main Belgian Army in Louvain. The reasoning behind this move was that it would be better suited if it joined King Albert and the main army rather than being bottled up within the forts and surrounded. The movement of the Third Division to join Albert left Liege with weakened defenses as German reinforcements continued to strengthen their chokehold around the city. The few Belgians in Liege were eventually forced to surrender the city. Even though the city was in German hands, the forts were still intact, and the guns of the forts controlled the roads coming in and out of Liege. The German’s held Liege with approximately 120,000 men, but could not move in and out of the city without being under persistent artillery from the forts. The Germans could only move undetected at night and in small parties. In the meantime, the Allies sluggishly reacted to honor their guarantee to protect Belgian neutrality. The French, under General Joseph Joffre, were too infatuated with attacking through Alsace-Lorraine, and were indifferent to the genuine threat on their left in Belgium. The British, who decided on sending an expeditionary force of four divisions of infantry and cavalry, were slow in transporting these men across the channel to help the besieged Belgians. General Erich Ludendorff, the new commander of the Fourteenth Brigade, realized the Belgian forts were not going to surrender even with Liege occupied. He decided on a method other than sacrificing his men in useless frontal assaults. He ordered up some 305 mm Skoda siege mortars borrowed from Austria, and a 402 mm howitzer produced by Krupp steelworks. None of these steel behemoths had been used in combat before. The 402mm Krupp weighed 75 tons and had to be transported by rail in five sections then set in concrete before going into action. It would fire up to ten 2,200 lb. projectiles per hour. It had a range of up to nine miles and was fired by an electric charge with a 200-man crew. On August 12, the German government relayed another message to King Albert demanding the Belgians surrender. “Now that the Belgian Army has upheld its honor by heroic defense to a very superior force,” the Germans arrogantly indicated, they asked that the Belgians spare themselves from “further horrors of war.” King Albert refused to reply. The massive siege guns were soon unleashed on each fort in succession. The forts had a major weakness in their design. They were vulnerable to artillery attacks from the rear. The siege guns took two days to assemble, and on August 12, they began to pound the remaining forts in detail. The massive shells decimated the defending concrete and steel forts and buried the defenders. The forts could not return fire as the German guns were out of range. The defenders of each fort were forced to hunker down and withstand the bombardment. On August 13, three of the forts fell. Fort Pontisse withstood forty-five shells in 24 hours of bombardment before it was taken by an infantry assault. Fort Chaudfontaine surrendered with only 75 out of 408 still alive from the hellish shelling. By August 14, all forts east and north of the city had fallen. After the eastern forts were reduced, the siege guns were brought up against the forts positioned to the west of the city. Fort Boncelles survived a 24-hour bombardment but soon fell on August 15 leaving little more than particles of concrete and scraps of metal. The bombardment left clouds of poisonous gas. By August 16, eleven of the twelve forts had fallen. Only Fort Loncin remained. General Leman had positioned himself in the last standing fort. The bombardment lasted for three days, from August 12-15. In an interval between the bombardments, the Germans sent emissaries under the white flag to try and convince Leman to surrender the garrison. Leman refused all demands. On August 16, Loncin was hit by a 420 mm shell that penetrated the magazine and exploded, demolishing the fortress. Hopeless as the situation was for the Belgians, they attempted to hold on to the fort. The last twenty-five or so Belgian defenders still able to stand were found in a corridor preparing for a last ditch effort to ward off the Germans. In another instance of tenacity, a corporal valiantly tried to drive the Germans back single-handily by firing his rifle in vain with one good arm, as his other arm was dangling wounded at his side. In a show of compassion, the Germans threw down their weapons and ran to the aid of the Belgian soldiers. Of the 500 defenders in Fort Loncin, 350 were dead and 150 wounded. Fort Loncin in the aftermath of the battle. The day after the fall of Fort Loncin, the German Army resumed its march through Belgium toward France. Though unsuccessful at Liege, the Belgian forces had delayed the German advance for two priceless days in its sweep toward France. The German invasion was stopped dead in its tracks on the Marne River on the outskirts of Paris in September of 1914. The chance of a quick German victory faded away and trench warfare began in earnest. Leman was kept as a prisoner of war until December 1917, when due to his failing health, he was released to travel to France. After the war, he returned to Belgium with a hero’s welcome for his heroic defense of Liege. He retired to the city he was born and fought to defend. He died on October 17, 1920. Some may argue that the importance of the two-day defense of Liege is inconsequential. However, the Belgians helped to dramatically alter the outcome of the 1914 campaign. The Times of London declared that Belgium earned “immortal renown” by helping to shatter the superstition that the German armies were invincible. Today Fort Loncin is a grave to roughly 300 of those who died and remain buried in the wreckage. Did you find this article interesting? If so tweet about it, like it, or share it by clicking on one of the buttons below! Davis, Paul K. Besieged: An Encyclopedia of Great Sieges from Ancient Times to the Present. Santa Barbara: ABC-CLIO, 2001. Donnell, Clayton. The Forts of the Meuse in World War I. Oxford: Osprey Publishing, 2007. Horne, Charles F. The Great Events of the Great War Part Two. Volume II ed. The National Alumni, 1920. Keegan, John. The First World War. New York: Vintage, 2000. Lipkes, Jeff. Rehearsals: The German Army in Belgium, August 1914. Leuven, Belgium: Leuven University Press, 2007. Meyer, G. J. A World Undone: The Story of the Great War, 1914-1918. New York City: Delacorte Press, 2007. Pawly, Ronald, Pierre Lierneux, and Patrice Courcelle. The Belgian Army in World War I. Oxford: Osprey, 2009. Tuchman, Barbara Wertheim. The Guns of August. New York: Ballantine Books, 1990. Tucker, Spencer C., and Priscilla Mary Roberts. World War I: A Student Encyclopedia. 5 vols. Santa Barbara: ABC-CLIO, 2006. The Defense of Liege by W.B. Wollen. Source: available here. The German invasion through Belgium in August of 1914 was presumed to have been an effortless undertaking. The German soldiers and their officers were stunned by the tenacious defense the Belgians exhibited. The soldiers of the Belgian Army were jokingly referred to as “chocolate soldiers” for the way in which they would melt away in combat from any determined opposition. The Kaiser once said to a British officer, “I will go through Belgium like that!” slicing his hand through the air. However, this gallant little nation shocked and inspired the world with their dogged stand against an enemy invasion force that outnumbered them roughly fourteen to one. “Brave Little Belgium” became a rallying cry around the world signifying a free nation defending their sovereignty against an aggressive German invader. The Belgian Army was ill prepared to face the juggernaut of the German Army. It numbered seven divisions amounting to 117,000 men, with only 93,000 considered combatants. The Belgian forces in the forts surrounding Liege numbered around 4,500 men, with the mobile Third Division stationed in the city composed of 25,000 soldiers. The Belgian Army was considered one of the most decrepit armies in Europe. The cavalry still wore early nineteenth century uniforms, with the infantry sporting shakos, bonnets, or bearskins as headgear. In some instances, machine gun crews were drawn behind teams of dogs. What the Belgian forces lacked in size and modern equipment though, they more than made up for in their tenacious willpower to defend their borders. The neutral nation of Belgium found itself positioned in the center stage of a colossal conflict when the Great War broke out in August of 1914. The German General Staff dusted off the Schlieffen Plan geared to strike a devastating blow to their French enemies. They sensibly anticipated that France would naively concentrate an offensive toward Alsace-Lorraine along the Franco-German border. The German General Staff was delighted when the French proceeded to overextend themselves in this aggressive movement. While France was preoccupied with this maneuver, the Germans concentrated their soldiers on the opposite side on the Ardennes in an aggressive flanking movement. The heavily wooded Ardennes would shield this movement, allowing German infantrymen to boldly sweep around the French left flank and crash into Paris. The movement would allow them to outflank and strike the French Army from an exposed position. This was a brilliant strategy aimed to end the war with one swift and devastating strike. One of the many major flaws in the Schlieffen Plan was underestimating the opposition of the neutral nation of Belgium. In order to successfully implement the Schlieffen Plan, German soldiers would have to move through Belgium. This movement would allow for the easiest route to travel through northern Germany into France. An ultimatum was sent out on August 2 with a twelve-hour window to reply. The Germans demanded that the Belgian King, Albert I, grant them military access and allow their infantrymen to march through Belgium uncontested. Albert was skeptical of German intentions, and flatly refused, asserting that if they entered Belgian territory their neutrality rights would be violated. The Germans moved into Belgium nevertheless, deliberately violating Belgian neutrality. The Belgian’s only hope was to contain the German Army long enough for French or British support to arrive. If a stand was to be made, it would be done at the formidable fortresses surrounding the city of Liege. The city of Liege was strategically located on a high bluff overlooking the Meuse River. Twelve massive triangular forts surrounded Liege, forming a circle of thirty-six miles in circumference. Each fortress was located a distance of six miles from the center of Liege. The fortresses were two to three miles apart, with fortifications dug in between to form a connected chain. Fourteen guns were located in each fort under revolving iron turrets and secured in concrete. Built to garrison around 200 men, these forts were made to withstand direct hits from the heaviest of artillery. World opinion viewed the position the most fortifiable in Europe, and expected it to hold out at least nine months against any serious military threat. Albert named his former teacher at the Belgian War College, Gerard Mathieu Leman, as the overall commander of the forces surrounding Liege. He could not have selected a better man for the defense of Belgium. At sixty-three years old, the commander would be fighting literally in the city of his birth in 1851. In the prelude of the battle of Gettysburg in the summer of 1863, Abraham Lincoln claimed the newly appointed Pennsylvanian commander George Meade would “fight well on his own dunghill.” Albert must have had the same predispositions of Leman. In his youth, Leman was admitted to the Belgian Military School in 1867 and proved to be a brilliant student. He opted to serve in the engineers upon his graduation in 1872. In 1880, he was placed in command of the Belgian Royal Engineer Corps. In 1898, he was made professor of mathematics and fortifications at the Belgian Royal Military School. The scholarly papers related to mathematics and siege warfare published by Leman earned him world renown. In 1912, he was made a lieutenant general. Leman was described as a somber, distant man who inspired respect rather than devotion. Albert appointed him a permanent member of the National Defense Council. This gave him command of the Third Division and the Liege fortified zone on the border with Germany. He zealously studied the approaches to the Ardennes and Meuse River crossings in anticipation of the German invasion. Albert gave Leman a direct order to hold Liege “to the end”. This was a daunting task for the inadequate force he had at his disposal. Roughly 60,000 soldiers were detached from various units in the German Second Army to form a special striking force to attack and neutralize the forts surrounding Liege. The Army of the Meuse, as it became known, consisted of six brigades under the command of General Albert Theodor Otto von Emmich. General von Emmich was convinced the Belgians would quickly submit. The attack then began, and the Belgians offered much greater resistance than the Germans had imagined. Next time we will continue this little-known tale… Find out what happened here. The Siege of Leningrad and the Battles for Moscow and Stalingrad in World War Two (WWII) are well documented, but very little, certainly in the West, has been written about the Eastern Front during World War One (WWI). Apart from the crushing blows to the Tsar’s Imperial Russian Army at Tannenberg, the Masurian Lakes and the German Army’s march east, the only other battle that ever seems to get a mention is the short lived Brusilov offensive in June 1916. Here, the author Frank Pleszak returns to the site and tells us about the little known Battle of Vileyka in September 1915. During WWI there was significant fighting and demonstrations all along the eastern front from Riga on the Baltic Sea in the north all the way south to Romania, and once Romania entered the war, right down to the Black Sea. My dad was born and raised in a small Polish village about 100 kilometres east of Vilnius near to Lake Naroch (in what is now Belarus). Though he never mentioned it, there was a huge, and to the Russians catastrophic, battle there in the spring of 1916. It was of such importance that the historian Norman Stone said of it “Lake Naroch was, despite appearances, one of the decisive battles of the First World War. It condemned most of the Russian army to passivity”. The ‘Battle of Lake Naroch’, the ‘Russian Spring Offensive of 1916’, occurred following the Russian ‘Great Retreat’ when the Eastern Front had settled down into positional trench warfare. It was an ill conceived, poorly planned, and disastrously executed Russian offensive across a front of nearly 100km over a series of frozen lakes and swamplands. Its intention was to bring Vilnius into striking distance in an attempt to draw German troops east and away from their offensive on the Western Front at Verdun. The Russian 2nd Army massively outnumbered the Germany XXI Army Corps, almost 450,000 infantry to 75,000 but suffered staggering losses of more than 120,000 while the Germans lost about 20,000. After two weeks of bloody and futile fighting in the most appalling conditions the battle came to an end with the Russians having only captured a tiny area to the south of Lake Naroch. 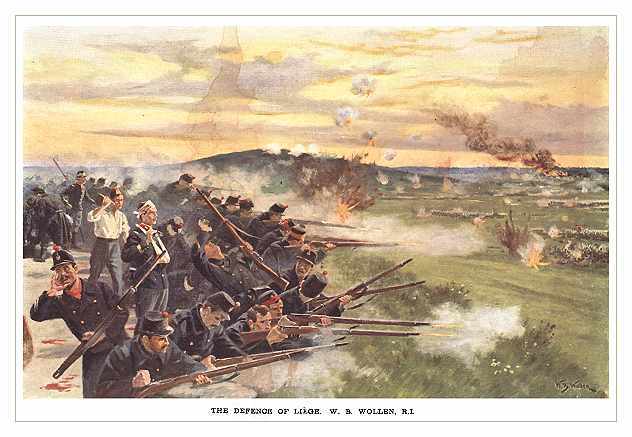 Fighting at Ladischky-Bruch during the Battle of Lake Naroch. There is almost nothing written about this battle in the west and it is in danger of being lost to history. In a small effort to prevent this happening I have researched the battle from both sides and almost completed a book on the subject that should be published later this year. So, following on from the success at the second battle at the Masurian lakes at the end of February 1915, the German X Army, commanded by General von Eichhorn, after heavy fighting, had by mid-August, taken the strategically important fortress at Kaunas but then found the capture of the city of Vilnius altogether harder. After regrouping to the north of Vilnius, supplemented with additional reinforcements, von Eichhorn’s X Army bypassed Vilnius and towards the end of August broke through Russian General Radkevich’s 10th Army in the so called Swenziany (Švenčionys) gap. Elements pressed on east through the city of Postavy towards Hlybokaje, but the bulk of the force headed south-east towards the City of Maladzyechna (Molodechno) and the primary objective; the city of Minsk. By mid-September, amidst stiff opposition, General von Garnier’s VI Cavalry Corps (H.K.K.6.) had captured the towns of Vileyka and Smorgon. The 3 Cavalry Division moved on towards Maladzyechna, some units even approached the west of Minsk, and others had penetrated to the east of Minsk and attacked a bridge along the Beresina River south of Borisov. Stavka, the Russian high command, were clearly concerned. Not only was Maladzyechna an important railway cross roads but it also contained important secret government and military installations. German cavalry attack at Vileyka. On 17 September, as the German X Army began to surround Vilnius, Russian forces were withdrawn and the city ceded to the Germans. But as the German Army marched east their supply lines had increased and become severely stretched. Russia’s had shortened and their material losses were made good from increased production at home together with supplies from France and England. The Russian 2nd Army, devastated at Tannenberg and then obliterated at the Masurian Lakes, had re-formed and re-grouped, and under General Smirnov were given the ‘honour to finally halt the German advance’. The H.K.K.6.’s rapid advance had left them vulnerable. Whilst they had easily crossed the rivers, streams and swamps their infantry and artillery support struggled over rivers with bridges blown up by the retreating Russians. The Russian 10th and 2nd Armies struck back, and immediately halted the German advance before Maladzyechna, and then pushed them back north along a 40km stretch of the River Wilja from the town of Vileyka to Milcza where they were slowly reinforced with advanced infantry units of the 115 Infantry and eventually 75 Reserve Divisions. Extent of the German X Army Advance East. By 22 September the town of Smorgon between Vilnius and Maladzyechna had been recaptured by a combination of a Russian 10th Army offensive together with Russians withdrawing from Vilnius. The Germans were exhausted and hungry, most of their artillery and supplies of food and munitions were still far behind their front. The Russians counter-attacked at Vileyka. Smirnov’s 27th Army Corps commanded by General Balanin had moved into positions to the south of Vileyka along the southern bank of the River Wilja and bombarded German positions. At 16:00 an infantry company supported by a machine gun company attacked across the railway bridge south of the town, scattering the German defenders that enabled two companies to ford the river and through the night occupy high ground to the southwest of the town. 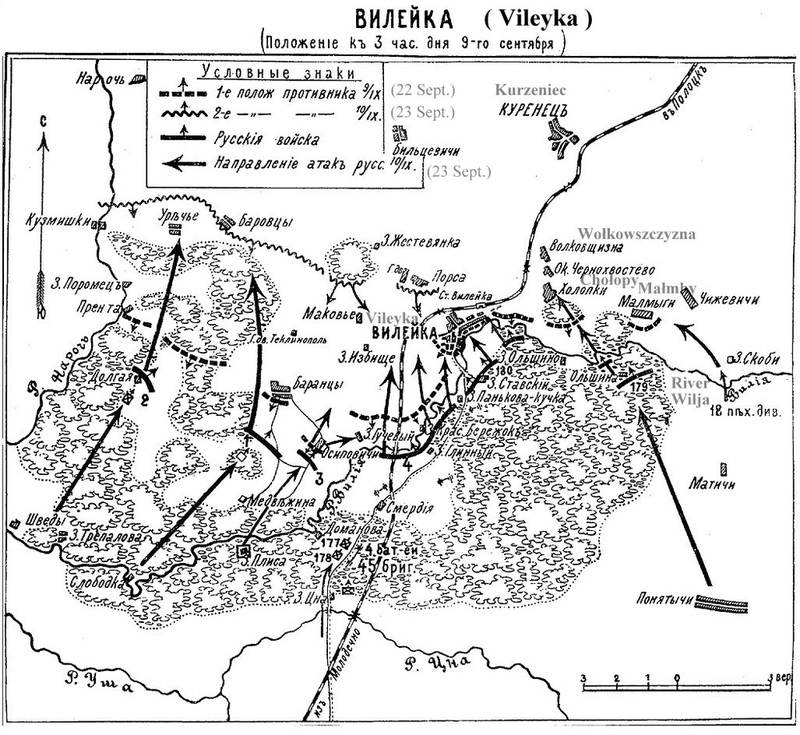 By the early morning of 23 September all the Russian artillery, including two heavy batteries, had assembled to the south of Vileyka and by the same time further infantry had crossed the Wilja near the village of Olszyna just to the east of Vileyka causing a distraction to the German defences. Taking advantage, a further three infantry brigades were moved quickly from reserve to consolidate the breakthrough. The Germans regrouped and counter-attacked the positions to the south and west, but even more Russian Infantry was brought up to assist. The German action was brave but futile and by mid-afternoon as the Russians massed ready to storm Vileyka from the south, southwest and west of the town the Germans stubbornly repeated their attacks. At 16:00 massed Russian artillery began bombarding the outskirts of the town and at 16:30, as the wooden houses burned, Russian Infantry moved forward from the south. Within minutes they had driven the Germans back towards the centre of the town. Fierce hand-to-hand and bayonet fighting took place at almost every building but by 17:00 the centre was under total Russian control. Dogged German resistance prevailed around the cemetery and at the nearby prison but with the assistance of targeted Russian artillery the fighting quickly moved to the northern outskirts where a German howitzer was captured. The Germans fought desperately to recover the lost gun but Russian support arrived and repeated German attempts failed. Russian Map of attack (original dates in Julian format). At the same time Russian units moved, largely unopposed, around the west of the town preventing any German withdrawal to the west. Fighting within Vileyka concentrated along the northern perimeter and particularly around the railway station where a furious firefight erupted with the station changing hands several times. More Russian units moved in from the southwest and eventually cleared the remaining resistance around the cemetery before moving to the northern edge of town where they helped capture the station. 20 kilometres to the east at the village of Sosenka Russian cavalry failed in an attempt to capture the bridge over the River Wilja that was guarded by a single company of 80 German defenders. But nearer to Vileyka Russian infantry had crossed the Wilja around the village of Kasuta and within 4 hours had forced the German X Army back along the road towards the town of Kurzeniec, capturing the villages of Kaczanki, Hrycuki, and Kłynie together with several light field guns in the process. Further Russian infantry crossed the Wilja capturing the villages Chołopy and Małmhy on the eastern outskirts of Vileyka. The remaining Germans were surrounded on three sides and their support was too far back to assist. Their position was hopeless so during the night all remaining units were withdrawn to new positions north of Vileyka around the village of Wołkowszczyzna. The battle for Vileyka was effectively over. The Germans, overstretched without supplies, exhausted and hungry, struggled on for a few more days but with increasing demands from the Western Front it became clear that the prospect of any further German short-term progress to the east was unrealistic. On 25 September General von Hindenburg ordered a halt to the advance east, withdrawal of all the forward troops along the River Wilja back to positions around Lake Naroch, and for the establishment of permanent defensive lines (Dauerstellung) which were developed through the winter of 1915. Frank Pleszak has written a book about his father’s journey from near Lake Naroch via the GULags of Siberia to England entitled Two Years in a Gulag. You can also hear an excerpt from the book in our related podcast here. Frank has also almost completed a book on the Battle of Lake Naroch. His YouTube presentation is here. He is working on a history of the Polish 2nd Corps – Anders Army. Finally, Frank’s Twitter handle is @PolishIICorps. Rebecca Fachner continues her series of articles on World War I by looking at how an assassination in an age of assassinations led to the outbreak of one of the most destructive wars of all time. You can read Rebecca’s first article in the series on Royal Family squabbles here. Just a couple of days ago, June 28, marked the 100th anniversary of the assassination of Archduke Franz Ferdinand in Sarajevo, a city that was then a (reluctant) part of the Austro-Hungarian Empire. Franz Ferdinand was the heir to the Austro-Hungarian throne and his assassin was Gavrilo Princip, a young Serbian nationalist who was part of a terrorist syndicate called the Black Hand, who were determined to assassinate the Archduke. It is important to note that some members of the Black Hand were quite closely associated with members of the Serbian government, and it is possible that Serbia knew about and even funded the assassination attempt. At least that is what Austria-Hungary chose to believe in the aftermath of June 28. Ironically, the assassination attempt was almost a complete failure. Several members of the Black Hand were stationed along the Archduke’s tour route, and the first attempt on him was a bomb thrown toward his touring car. The bomb killed several soldiers and onlookers, but did not harm the Archduke or his wife. After recovering from their ordeal, the Archduke and his wife insisted on visiting the victims in the hospital, and as they headed to the hospital their car stalled. Princip happened to be in a café across the street, heard the commotion and seized his moment. Gavrilo Princip assassinating Archduke Franz Ferdinand. By Achille Beltrame and published in the Domenica del Corriere newspaper. By all rights, neither Ferdinand nor Princip should have gone down in history. The assassination, while of course tragic and potentially politically destabilizing, should have remained an internal Austro-Hungarian matter, making the two men at best a minor footnote in European history. Moreover, it was an age of assassination. In the fifteen years prior to 1914, the kings of Italy, Greece and Spain had been assassinated in addition to the Grand Vizier (Prime Minister) of the Ottoman Empire as well as the Prime Minister of Japan, and the President of the United States. Who outside of their own countries can now identify any one of these men? With so many assassinations taking place in this period, why is it this one that is remembered? The memory of Princip and Ferdinand looms large because of what followed from the assassination. This particular assassination has gone down in history as the short-term cause of the First World War, setting off a chain of events that led Europe into war. It really wasn’t a cause so much as an excuse; Europe was poised for war, many wanted war, even if they wouldn’t have admitted it, and there had been several incidents in the recent past that almost resulted in war. With Europe primed and ready, it was only a matter of time before something finally sparked a fight, and this was it. Austria-Hungary was stunned and distraught by the assassination, not unreasonably, but the leadership dealt with their grief and indignation by looking for revenge. Austria-Hungary wanted to make the Serbians pay, and within a month issued a set of demands designed to bring Serbia to heel, and gave them forty-eight hours to comply or risk war. Serbia did not want war, but the Austro-Hungarian demands were simply too intrusive, as they were certainly designed to be, and Serbia rejected the most egregious of Austria-Hungary’s demands. Both Austria-Hungary and Serbia had sought assistance from their much larger allies/protectors, Germany and Russia, respectively, so both knew that if it came to war they would not be fighting alone. Russia, enjoying its role as Slavic protector, actually called for a partial mobilization first, but insisted that it was only a mobilization against Austria-Hungary. Germany begged Russia to halt its mobilization, and then declared war on Russia. Two days later, on August 3, Germany declared war on Russia’s ally, France. Germany was then faced with a serious dilemma, albeit one completely of its own making, as there was no good way for them to invade France without going through Belgium. Germany asked Belgium for permission to march their army through Belgium into France, which seemed from a German perspective to be a reasonable request. Amazingly, the Belgians did not agree, and politely declined to allow a massive foreign army to run roughshod through their sovereign territory. Germany invaded anyway. This alerted the British, who had signed a treaty guaranteeing Belgian neutrality, and Britain declared war on August 4. While this was all going on there were frantic letters and telegrams being written between the major powers, visits being arranged, peace conferences proposed, all in an effort to stop or slow down the march to war. Three days after Britain declared war, on August 7, the British Expeditionary Force arrived on the continent, and the Battle of the Frontiers began. The Battle of the Frontiers was a complex affair that took place in several stages and ultimately lasted until mid-September. In the East, by contrast, events moved at a significantly slower pace. 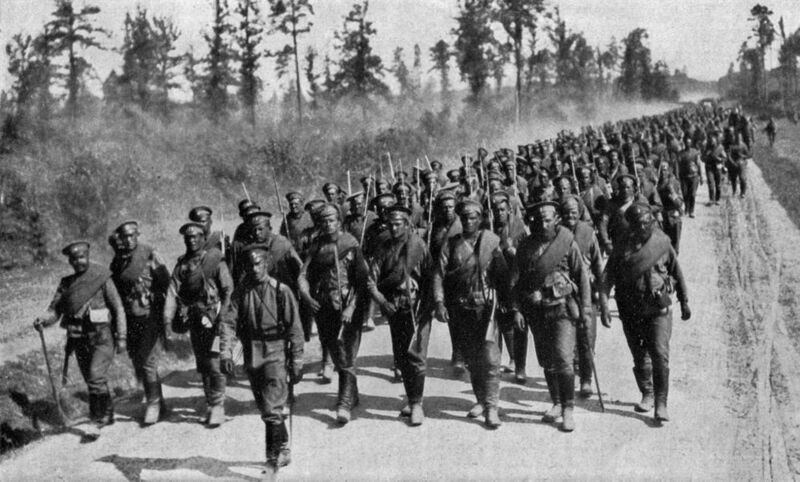 The Russians were a formidable enemy, but a very slow moving and technologically backwards one, and it took several weeks for their mobilization to be complete. By August 17, the Russians had fully mobilized and began invading eastern Germany. On August 23, the Battle of Tannenberg began, lasting for a week and becoming the first in a long line of humiliating Russian defeats. By August 23, therefore, less than two months after the assassination of the Archduke, Europe was completely at war. Germany was dug in on two fronts, and massive battles were taking place on a continent that had been completely at peace less than 60 days prior. And over what? A dead heir to the throne of a middle tier power, some national pride, and several very itchy trigger fingers. There are so many points along this timeline in which events could have conceivably, even plausibly, gone a different way. Austria-Hungary could have reacted differently, Germany and Russia could have stayed out of each other’s way, Germany could have ignored France or forced them to be the aggressor, or Germany could have avoided Belgium and therefore the British. The likelihood is that it wouldn’t have mattered if things had gone slightly or even very differently; war was virtually inevitable and if this series of events had not brought about a conflict, something else would have done. Nonetheless, one wonders whether Princip, spending the war in his prison cell, felt responsible for the carnage, or if he even realized his role in starting the greatest war Europe had ever seen. As always, your feedback is welcome. If you have the time to leave a comment below, we’d really like to hear what you thought about the article. Rebecca Fachner starts a series of articles on World War I by considering how close family ties between many European rulers may have contributed to the outbreak of war – like a family squabble on a grandiose scale. This summer marks the 100th anniversary of the outbreak of World War I, and over the next few months there will be plenty of articles and books that deal with the assassination of Archduke Franz Ferdinand, the diplomatic machinations between the various countries after the Archduke’s death, and the outbreak of hostilities a few weeks later. One of the most interesting aspects of the beginning of the war is how most of the major powers seemed completely prepared for war, but stunned that war broke out so quickly. It is then, worth considering the political situation before the war to understand why the situation fell apart in the way it did, with the speed that it did. Queen Victoria in 1887. Her relatives were closely connected prior to World War I. Many people have compared World War I to a bar fight; there is even an internet graphic floating around that imagines the entire war as if the countries involved were drunks fighting at a bar rather than nations. If the war itself was a bar fight, the political situation leading up to the war is best characterized as a family squabble. Part of the reason that a comparison to a family makes sense is that the European political landscape at that time was in some ways like that of a large family. King George V of Great Britain was a grandson of Queen Victoria, first cousin of Kaiser Wilhelm of Germany through his father and the Kaiser’s mother. He was also first cousins with the Tsarina of Russia, Empress Alexandra, herself a granddaughter of Victoria. To make family dinners even more complicated, George was also a first cousin of Alexandra’s husband, Tsar Nicholas II of Russia; their mothers were sisters. His own sister was married to King Haakon of Norway, whose brother was King Christian X of Denmark, both of whom were cousins of both George and Nicholas. George and Wilhelm also had cousins in the royal houses of Greece, Romania and Spain. Confused yet? Well, almost every European royal family was related to almost every other European royal family, and untangling the branches of the family tree is a complicated endeavor, to say the least. In an age when Europe was dominated by kingdoms and emperors, minor family disagreements became a huge problem. We all have family members that we don’t like too much for whatever reason, that’s the nature of families. But it is one thing if you don’t like your annoying cousin Nick or don’t trust cousin Bill, but when you all run countries, your dislike becomes both political and very important. Suddenly, the fact that you don’t trust your cousin has major policy implications for your government’s relationship with him and his government. This is not to suggest that pre-war alliances were purely based on family discord, or that the world lost millions of lives because of family drama. Two of the major players in the story were not linked to this large family: France because it no longer had a monarchy and Austria-Hungary because its rulers weren’t closely entwined in Queen Victoria’s royal circle. Since the war actually started between Serbia and Austria-Hungary, the non-family political situation was clearly very important too. As almost all histories tell us, World War I was the product of entangling alliances between the various powers, and their inability to stop the chain of events from overtaking them in the wake of the Archduke’s assassination. That is true; however, the crucial piece is not the entangling alliances, but the inability of each country in Europe to stop the train wreck as it was happening. The manifest weakness of many of the hereditary rulers of Europe was lethally exposed in 1914, along with their lack of diplomatic skills, their poor management style and general incompetence. It is impossible to say whether better and more skilled (i.e. merit based) rulers would have been able to stave off a war, but it does seem clear that letting nations behave like a dysfunctional family is not the way to international harmony. Unfortunately it took an awful lot of lives to convince world leaders that international conferences shouldn’t look quite so much like a family reunion. One of the most enduring legacies of the war is that it ultimately toppled a number of the monarchies in Europe, perhaps because the conflict exposed the problems of hereditary rulers to such an extreme extent. Hereditary rule is like rolling the dice with your leadership, sometimes you roll a Peter the Great or Frederick the Great; at other times you roll a Nicholas II or Kaiser Wilhelm. Taking that kind of chance might have been a good idea at some point in history, but in an age of warfare on a massive scale and increasingly deadly weaponry, the major powers needed more skilled diplomats to manage international affairs, not to mention better military commanders.